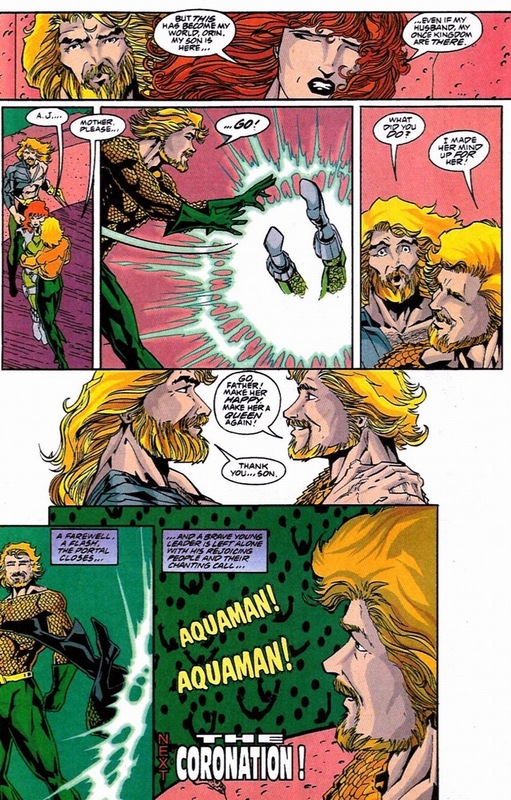 It took nine years to get these two back together after their marriage imploded, not that Aquaman stayed chaste or faithful or didn’t nail hordes of beautiful sea-women. But in 1998, thus began the fifteen issue long will-they-or-won’t-they games that elevate comic books to essentially soap operas with punching. Don’t get angry — we love the drama (and the punching). 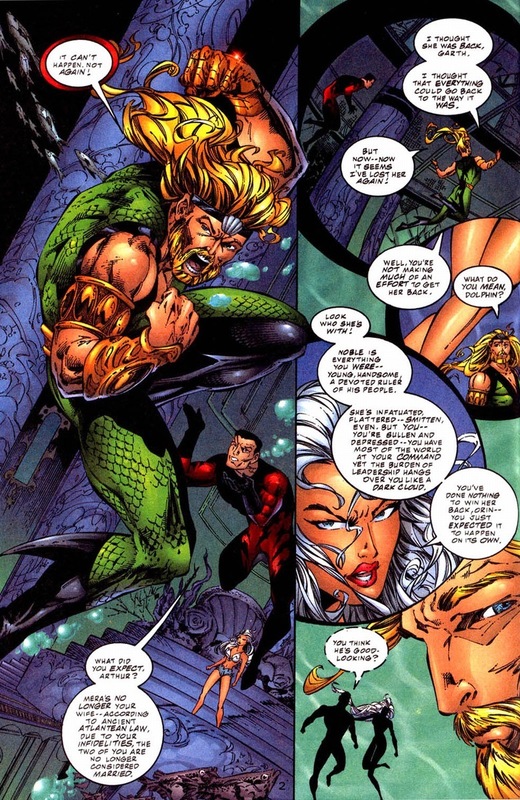 So today we begin their journey back in love from various scenes in Aquaman #47-62, written by Dan Abnett, Andy Lanning, Erik Larson, Chris Eliopoulos, & Gary Carlson and drawn by J. Calafiore, Eric Battle, & Mike Miller. Also note the massive amount of writers and artists if you detect any tone changes. Currently, an Aquaman impostor has invaded Atlantis. 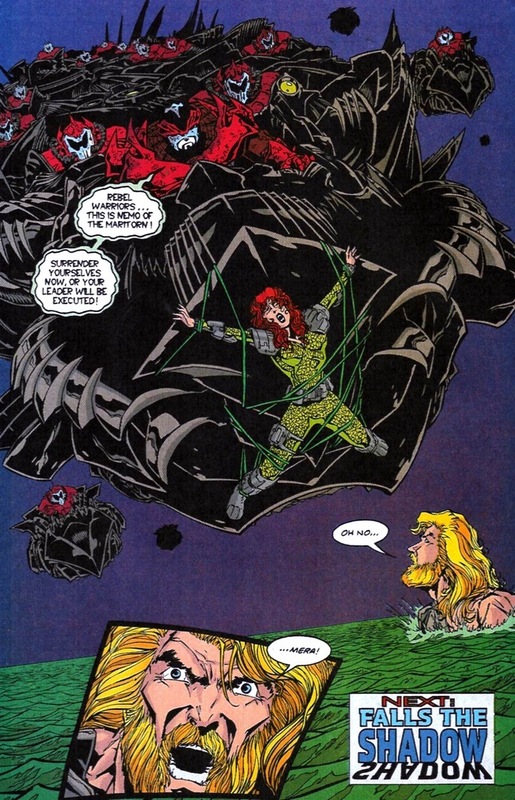 I bring this up just to prove Mera’s old claim wrong. 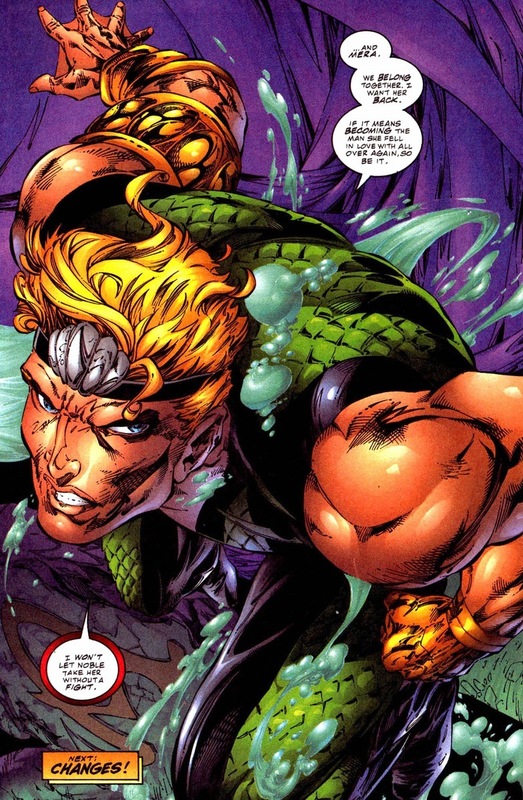 For this fake Aquaman to look exactly like younger, non-jaded Aquaman, our king’s genes must be overwhelmingly strong. Talk about going into the family business. 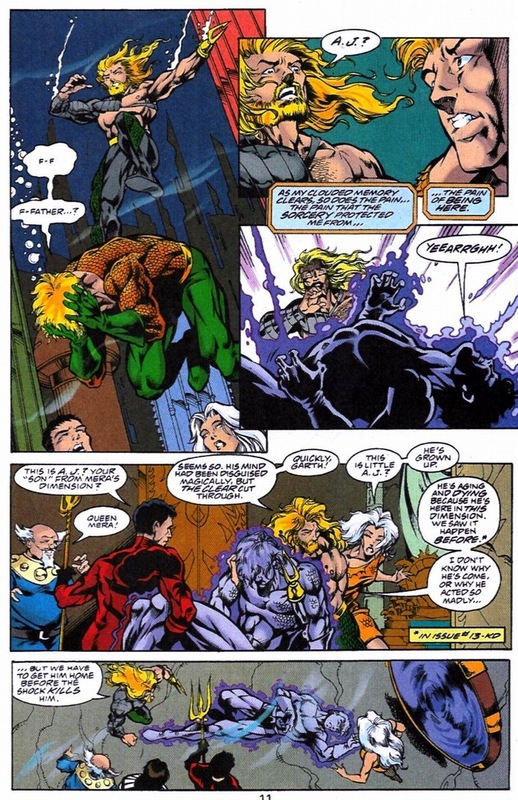 AJ, who is now definitely Aquaman and Mera’s son, can’t survive outside of his home dimension. It’s why you’ve never heard of him despite being an actual child of a famous superhero. I mean, you know Damian Wayne because he can do things like survive outside of an alien alternative dimension water world. Some kids get all the luck. 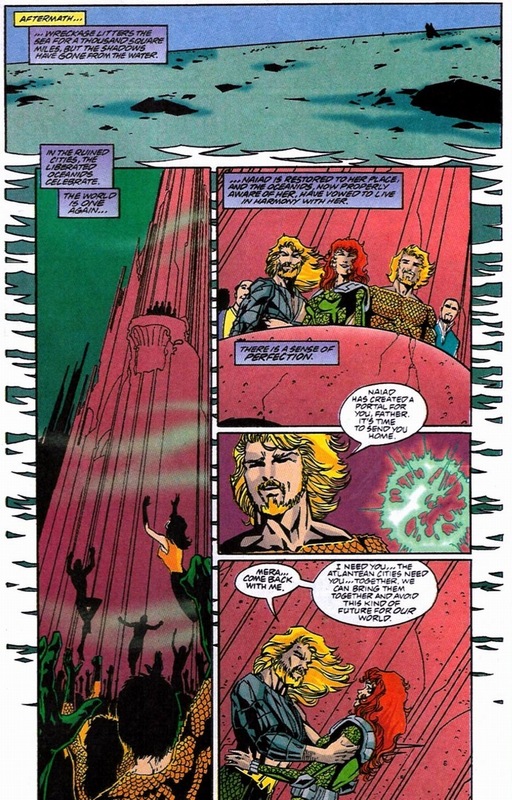 Aquaman and his son head to the other dimension to rescue Mera. I’m skipping the two issue war stuff. Our hero hits spaceships with tridents. And thus AJ never shows up in comics again. In the mid-2000s, a man named Arthur Joseph (AJ) Curry becomes the second Aquaman, but he’s unrelated to this one. Happy ending, right? Husband and wife are back together and I can end today satisfied. Except for one slight problem — something all the fish telepathy in the world can’t solve. 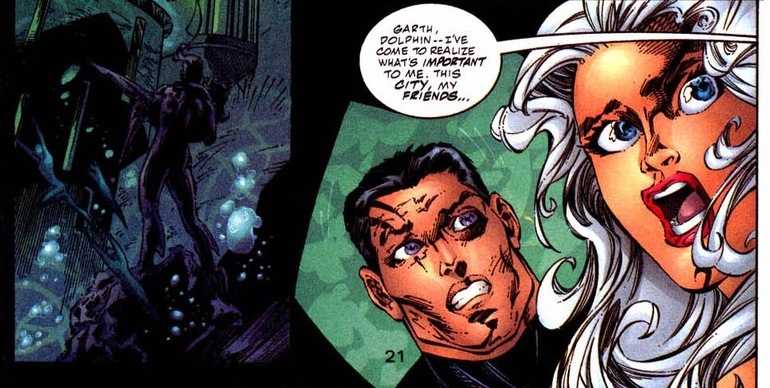 Turns out both of them cheated on each other, voiding their Atlantean marriage. On land, they’d still have to file some paperwork and stare bitterly at each other in court, but it’s much simpler underwater. 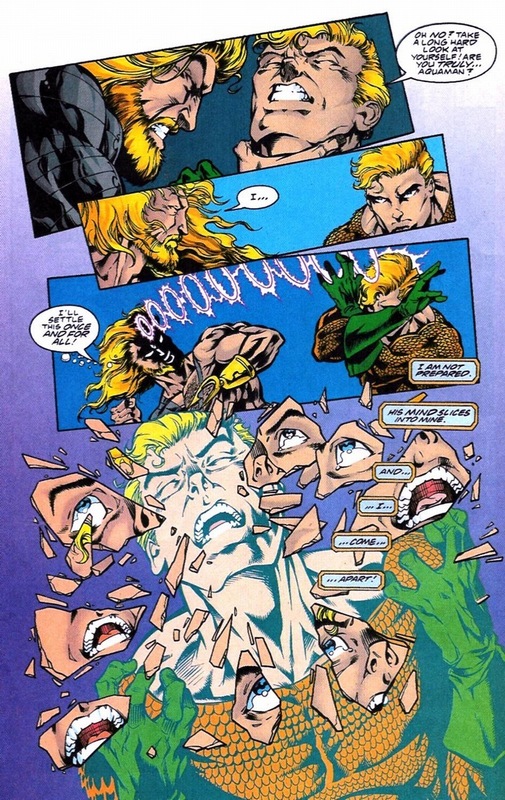 As you expect, Aquaman doesn’t take this news well. He has anger issues. 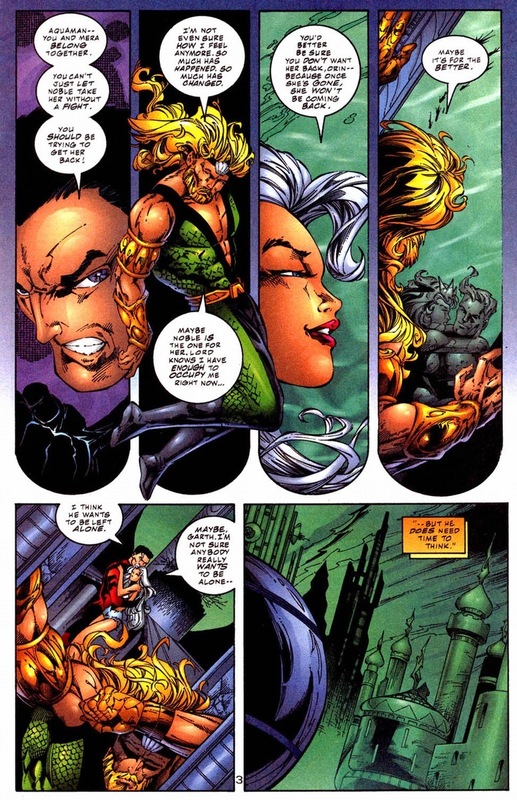 Even worse, Mera goes off and gets herself a new boyfriend named Noble, who sort of looks like a squid-tree man-elf. 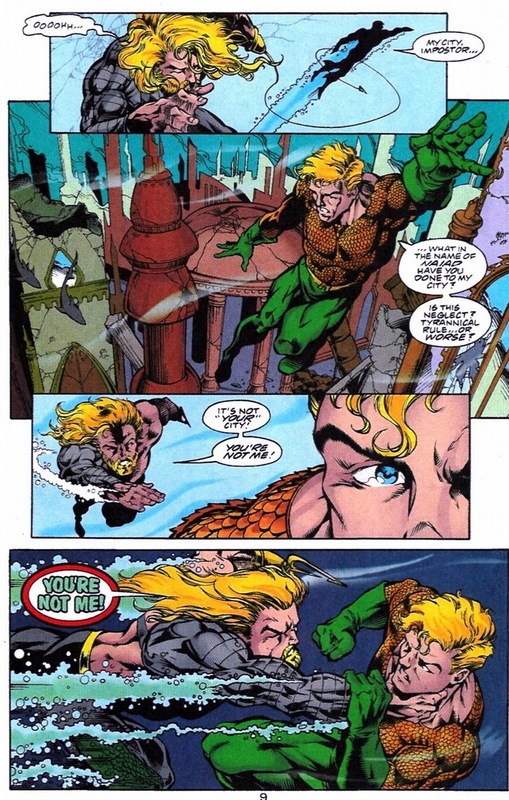 As Dolphin explains the reason why in the pages below — as writers attempt to overcompensate the world’s mockery by making Aquaman edgier and hairier, he lost all that charm he apparently once had. 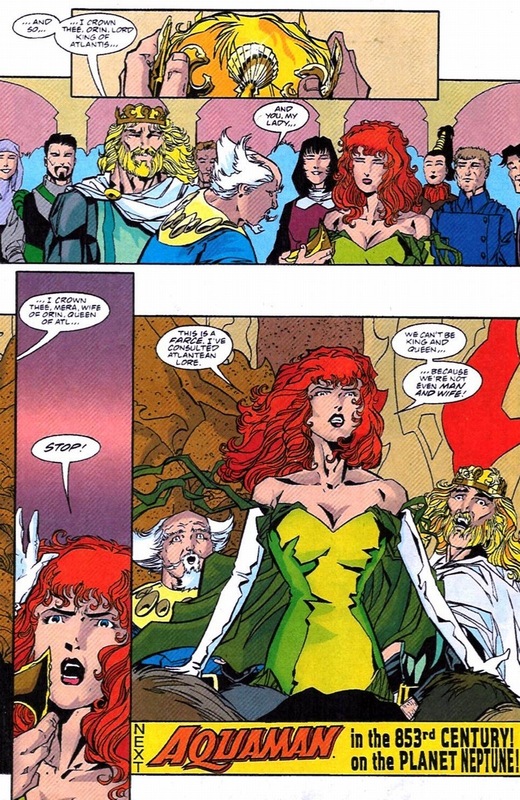 Most importantly, check out Noble and Mera’s idea of a wedding dress. For how cold the oceans are, how come no one ever puts on any clothes? That’s right. He shaved off his beard. Will that be enough? We’ll find out next time! Pretty cool look the Sea King is sporting in that panel. Says alot to me since I prefer the classic color scheme.